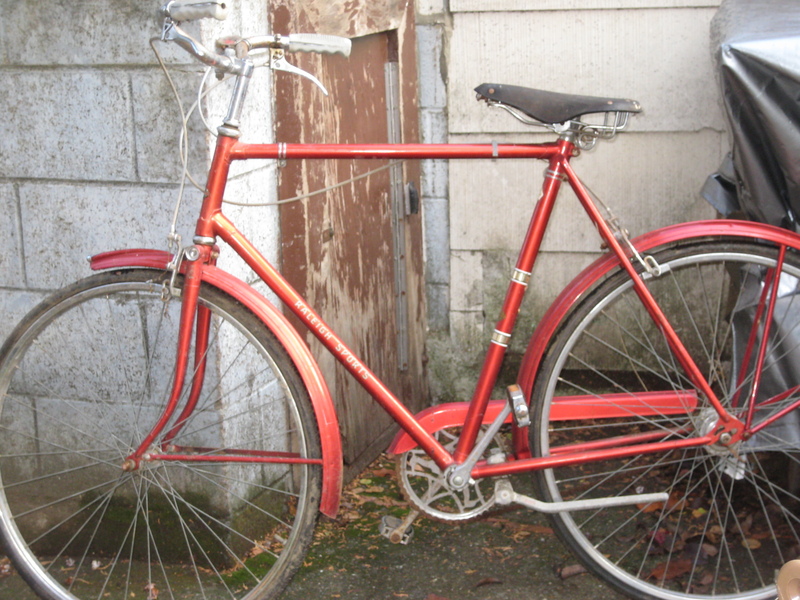 This red Raleigh stood at attention outside Claire’s house this morning, poised on the sidewalk on its kickstand. I confirmed it was to be disposed of. Rather than allowing it to be rolled away by some other greedy pack rat, I altered my outbound errand mission and altruistically rolled it home. The bike seemed to be dragging its feet a little. Flat tires, chain rusted in place, and quirky steering characteristics: evidence of inertia? Or a metaphor for my book project? Maybe Sheldon (for that is its new name) had advance knowledge of my overstuffed bedroom, or the fact that–after forty years of bike ownership, I’ve absolutely no clue how to replace the chain, let alone refurbish a gem in the rough. “Maybe this time I’ll be different” the voice of insanity whispered. In the time I’ve lived on Dogbark Lane I’ve collected fourteen orphaned bicycles. A few were put up for adoption by us (our neighbors Larry & Claudia, thank you..), but most were just leaning against a fence. JLAF. The bicycle’s version of JRA (Just Riding Along); a wastebasket term that precedes a tale of destruction to either bicycle or rider. All fourteen have been “mollified” not by Yours Altruistically, but by His Royal Hardworkingness. And that means: they are his. Not mine to re-ruin, re-wreck, un-furbish. His. Well, maybe this time it will be different. I took out a subscription at the brand new cooperative Bicycle Works. Spokey Godfrey didn’t seem bothered by a potential nightmare of a student taking up floor/mind space, and repeatedly failing to effectively grasp concept, wrench, or brake housing. ~ by jacquiephelan on December 7, 2009. Looks like your “new” Raleigh got pegged into something pretty hard…that fork looks like it’s going *straight down*. I bet you know somebody who could make you a new one, though! The ol’ Raleigh has some potential, though. It reminds me a bit of my own English 3-speed, a Hercules of the same era. Herk is the same sort of beautiful metallic red, too. Good find. There should be plenty of forks around. You have a new good friend. I had a Gresham Flyer (Raleigh) when I was a kid that very color. Enjoy it and breath life in to it, one more time. I have that same model in the bike room, just waiting for the appropriate rider.